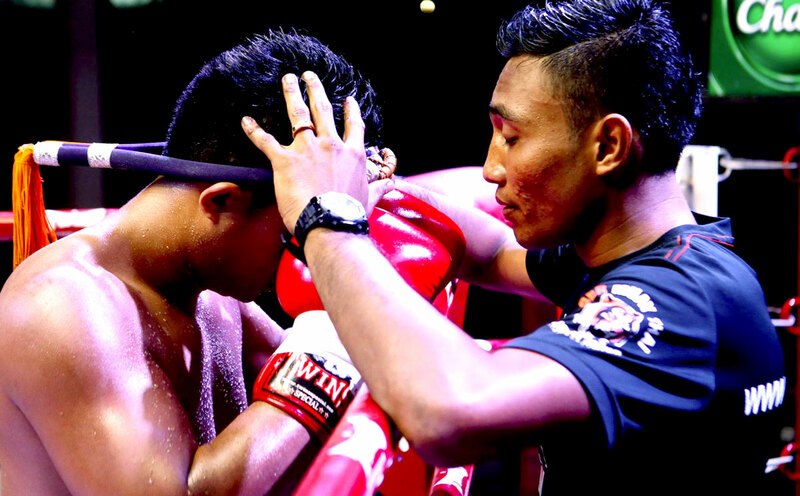 The Mongkon is a traditional headpiece circlet worn by Muay Thai fighters when they enter the ring, and an integral part of the Muay Thai culture. Each gym or camp has its own unique Mongkon that represents the spirit and strength of the gym and it’s master instructor. It is warn on the head to bring prosperity and good fortune while warding away danger and injury. The Mongkon is worn as a fighter enters the ring and while he performs the “Wai Kru Ram Muay”. This is a ritualistic dance used to show respect for the fighter’s teacher, family, art of Muay Thai and the Kingdom of Thailand. Upon finishing the Wai Kru the fighter returns to his corner and a prayer is whispered between he and his second as the Mongkon is removed before the fight. According to Thai tradition and beliefs, how the Mongkons were made varied according to the practice of the master instructor. When Thailand was still named Siam, the belief was that the Siamese warriors tied a bandana-like cloth around their heads before engaging in battle. They would often chant Buddhist incantations like “Gam Baan Nak Muen” which meant “the clenched-fist weighing many thousands.” This began the tradition of the master instructors making and passing on a Mongkon to his student. Nowadays the Mongkon is embedded in Muay Thai culture, not only for Buddhist fighters but also for fighters of other religions. There are many different legends of how to imbue power into the Mongkon to provide strength and protection for the fighter. Some Muslim fighters (particularly in the south of Thailand and Malaysia) place scrolls of Quranic verses inside the Mongkon. Thai-Buddhist traditions include weaving the bones of fighter’s ancestor or the hair of a loved one into the Mongkon or adorning it with sacred amulets. Another Thai-Buddhist tradition is to have the Mongkon blessed by monks or a holy man, who will cast spells to aid the fighter with strength, courage and protection. The Mongkon is held very sacred by all Thai fighters and is always stored in a high place to show respect. The Tiger Muay Thai Mongkon has a sacred tiger amulet woven into it and was blessed in a ceremony at the nearby Wat Chalong, which is one of the most revered temples in southern Thailand.